My water heater will fire and run on propane. However, I do not get any hot water. Is there a bypass somewhere I missing? You mean from the taps? If that's the case it may have a water heater by pass system and the valves are off there is most likely a small door some where near the heater and you'll fine one or two small valves that need to be turned the other way. It would be a good ideal not to run the heater until you figure it out because the tank most likely is not full. 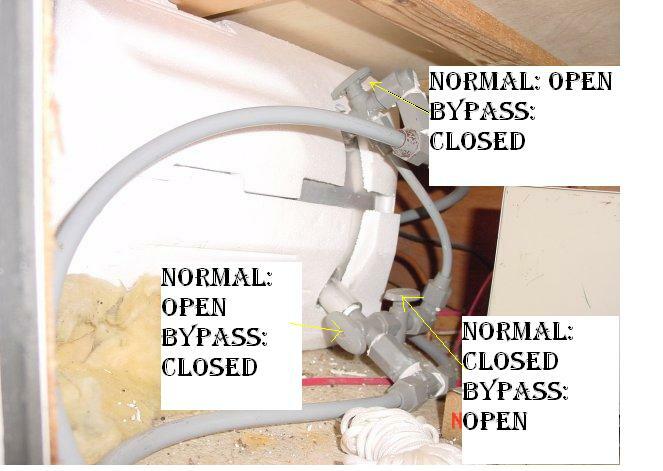 This is a picture of a bypass on a heater. This particular setup has three valves. Your vintage probably only has one valve on the bottom (if so, it has a check valve on the upper end), but there also may be two valves. But this will give you an idea of what to look for. Basically, when bypassed the water goes through the short piece of pipe instead of the heater. You'll still get water out of the hot taps, it just isn't going through the heater. BTW - DO NOT run it on ELECTRIC if there is no water in the tank, it will burn out the element almost instantaneously!! I have an '04 T-1950 also. You can access the bypass by lifting up the bed. You will need to crawl into the storage area get to the bypass. The tank is in the back left corner. Thanks for replies. I was camping last week and without the water heater. Now that I am back, I will check for the bypass at the tank under the bed. I bought this 2 years ago and have never used the water heater. I have always used the facilities in the campground. By the way, my T1950 is an '04.